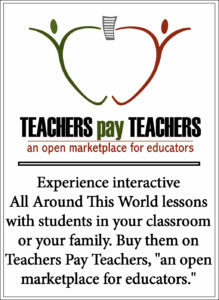 All Around This World’s classroom and homeschool lessons about global rhythms for kids introduce your family to music aplenty through interactive fun . . .
Every culture around the world expresses its essence in the music it creates. — Africa: some of us drum three beats and at the same time others drum two as we explore the wonders of polyrhythm. — South and Central Asia: we learn to speak out the bols and beats, flummoxing our way through the verbal percussion language known as konnakol. — Eastern Europe and the Baltics: it’s all about additive rhythms as make sense out of complex accumulations of 3s and 2s using pineaepples, apples and other syllabic fruit. — East and Southeast Asia: we stand tall and scream “HAI!” as we proudly drum our big taiko drums. — The U.S. and Canada: We bring back the best parts of 80’s–there were some!–as we breakdance. — Oceania and the Pacific Islands: we learn jaw-dropping Pacific rhythms and shake our hips to Tahitian Otea. — Western Europe and the Nordic Countries: we hop, leap and jump as we do an Irish reel and jig.